SugarSync is among the best sync software in 2016, SugarSync goes even further in data backup and sync, SugerSync provide a Continuous online backup of your files to your secure, personal SugarSync website, with Automatic File Versioning, and Syncing files, photos, music and more between all of your computers is easier than ever with SugarSync. SugarSync works quietly in the background to keep whatever files and folders you desire in sync across all of your computers, SugarSync scored excellent in backup/restore and sync and it’s the lightest running sync software on CPU and memory. Cross-platform Mac and PC file transfer and synchronization. If you travel frequently or often work on multiple computers or devices, you’ll appreciate the freedom SugarSync gives you. With SugarSync, you can easily view or make changes to remote files and documents from a mobile device, a colleague’s computer, or from an Internet cafe on the other side of the world. 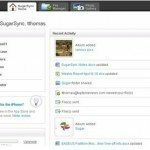 Just log in to the SugarSync website from any computer with a browser to access your remote data. Any changes you make will be saved and synced back to your other computers. SugarSync gives you the flexibility to leave your laptop behind and know you’ll always have access to your important data. SugarSync has a full lineup of features, with the new features set and enhancement make it our first choice for best sync software in the market , such features as online file backup works right alongside you, backing up the changes you make to your files as you go. There is never any manual uploading or scheduling required and the SugarSync backup service works quietly in the background without interfering with your productivity. Once your initial online backup is complete, you won’t even know it’s running. One of the new feature is File Versioning which is Viewing and restoring older versions of your files, you no longer need to manually save files with separate names in order to keep track of the older versions. Now when you update a file, the previous versions (up to five) are archived for you automatically!. Now you can share any folder with anyone – business partners, colleagues, family and friends. SugarSync makes it seamless for others to work on the content as if they were working on their own. SugarSync also keeps track of the changes for you so you will always be on top of your files. We make sure you have the full control of your folders and peace of mind to share them. 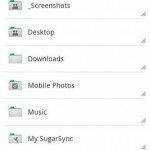 SugarSync has several features, some of which is not included in many of the other Sync Software or Backup Software. The included Remote access to your files from any browser on your personal SugarSync website. SugarSync makes your file security a priority. They have bank-grade encryption enabled on all file transfers and file storage. This means that your files are protected from the prying eyes of hackers.